Spread your choice of mayonnaise, blue cheese dressing, or ranch dressing on both halves of the croissant. 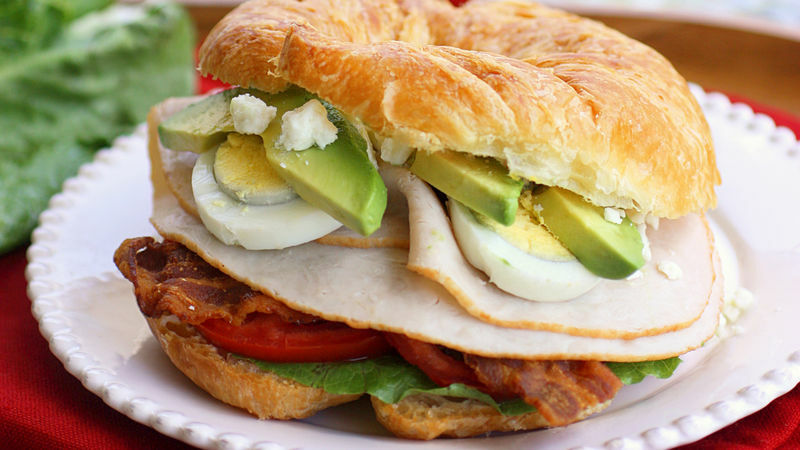 Layer one half of each croissant with lettuce, tomato, bacon, 2 slices of ham (or turkey\chicken), onion, sliced egg, 2 avocado slices, and a tablespoon of blue cheese crumbles. Place other croissant half on top and enjoy! Whenever I go to a restaurant, the first thing that I look for on the menu is some version of a Cobb salad. Something about bacon, egg, avocado, and blue cheese mingling all on one plate makes my mouth start to water. What I love about a Cobb salad is that it’s loaded with a ton of toppings. My husband always teases me that I eat everything BUT the lettuce in a salad so a Cobb salad is a dream to me. Of course, if I happen to get a piece of lettuce stuck to my fork while digging for some bacon then I’ll eat it. So the perfect solution to my lettuce aversion is to make the classic Cobb salad into a sandwich. This Cobb Salad Sandwich has all of those to-die-for toppings of my favorite Cobb salad piled onto a buttery, flaky, croissant. Seriously, heaven. And in sandwich form there’s only one leaf of lettuce getting in my way of avocado and bacon paradise. You can spread mayonnaise on your croissant as your “dressing,” or if you’re a little more daring spread some blue cheese or ranch dressing. I’m greedy so I put a little mayo and a little blue cheese dressing on my sandwich here. I couldn’t stand it any longer…I had to take a bite! Talk about a flavor party in your mouth.